CT scan of the abdomen showed multiple masses measuring 7.3 x 5.1 cm, 6.3 x 6.1 cm and 7.3 x 4.5 cm, in the right lobe of his liver, suggestive of diffuse hepatocellular carcinoma or liver metastases. A biopsy was performed on 23 December 2010 and confirmed moderately differentiated infiltrating liver cancer. Mutu was prescribed Nexavar – an oral chemo-drug that cost about RM20,000 per month. He was told that Nexavar would not cure his cancer. It would only control it (whatever that means, see discussion later). Listen to our conversation on 23 January 2011, the day he first visited us. Let me highlight some of the important points of this case in a question-and-answer format. Assuming for a moment that you are a medical expert. I believe you have seen hundreds or thousands of CT scans and blood test results. From your experience, what can you make out of this case by just looking at the scans and blood test results? The images are bad and the AFP (alpha-fetoprotein) exceeded a million points. Honestly, is a biopsy really necessary? So, after a biopsy, what can you offer to “cure” the patient? It appears that all that modern medicine can offer is Nexavar. Would you as an expert offer this drug to the patient knowing that it cost about RM 20,000 per month and it does not cure? I guess you would if the patient is rich enough to pay for it or if his insurance covers the cost. This is a win-win situation you may say. After all this is what buying a health insurance is for! But hang on. In this case what if Mutu’s total medical cover is limited, assuming it is RM 100,000? That means the insurance pays for only five months’ supply of Nexavar. What happens after that? And within 8 to 11 months patient dies (see point 4 below)? As an expert, would you admit to your patient that Nexavar cannot cure his cancer? Yes, you did in this case. That is honorable of you. Obviously not many patients are going to pay that kind of money if there is no cure. You justified by saying that Nexavar can control it. That sounds good, convincing and heroic isn’t it? Especially if the patient is desperate and helpless. Such patients need that “last straw”. But what do you really mean by control? Have you gone into the website of the drug company that sells Nexavar? If you do, you may find this very impressive table with equally impressive so-called “scientific” data. In a study of 602 people … Nexavar helped slow cancer growth and helped extend the lives of patients compared with patients who did not receive Nexavar. Nexavar extended overall survival by 44%. For the benefit of those who are not used to reading and interpreting research data, let me explain a bit more. From the diagram above, we know that there were 299 patients taking Nexavar (n= 299) and the median overall survival is 10.7 months. Compare this to 303 patients who did not take Nexavar (group called Placebo, n = 303) which had a median overall survival of 7.9 months. By taking Nexavar patients lived longer by 2.8 months. Take note that they were not cured at all. Eventually patients died. The median survival ranged from about 8 to 11 months, irrespective of whether they take Nexavar or not. So based on the above experimental data, ask this question. Would you spend RM 20,000 per month and for every month, to live 3 months longer? Again, take note that the price of Nexavar varies – depending on where you buy it and whether you pay cash or pay through insurance claim. Obviously the price is higher when your insurance pays for it. Of course, if this point is crudely presented like I did above, extending life by 2.8 months is not impressive at all! The educated people deviced a better way of saying things in a nicer, attractive but deceptive way. 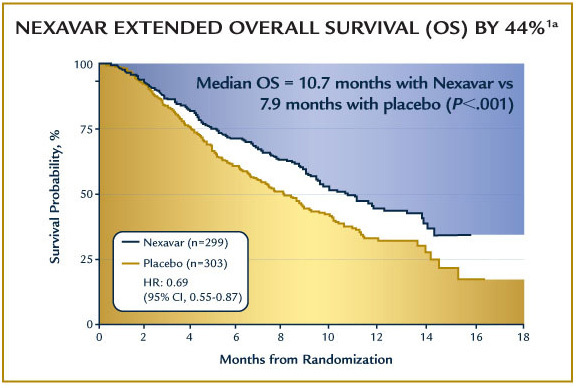 Another way of saying is: Nexavar extended overall survival by 44%. Increasing survival by 44% is very impressive indeed. Mark Twain (of the USA) made famous this phrase: “There are three kinds of lies: lies, damned lies and statistics.” This phrase is now used to describe “ the use of statistics to bolster weak arguments, and the tendency of people to disparage statistics that do not support their positions”. In simple language, the statisticians (the experts of numbers) “massage” the data to make what seems ugly to look pretty. Take note also this “manipulation or massage” of data is not wrong – it is academically legitimate! With a simple mind like common folks, I would have just do this: I would take 10.7 minus 7.9 = 2.8. Then I would divide 2.8 by 7.9 and multiple by 100 to convert it into a percentage. If I did this, I ended up with only 35%. To avoid having to explain “the confusing concept of statistics” let us give the benefit of the doubt to the experts and the drug manufacturer and accept what they say: Nexavar extended overall survival by 44%. But folks let’s concentrate on what matters most. You can choose between these two “options” below. But know that both mean the same thing! As a patient if you are told that Nexavar can extend survival by 44%, what would be your reaction? On the other hand, if you are told that Nexavar can extend your life by only 2.8 months, what would be your reaction? Having got over this, what if you are clearly told that the extension of survival by 2.8 months is no free lunch. Apart from having to pay RM 20,000 per month, there are a variety of side effects you may have to endure. In this case, Mutu suffered eight side effects after consuming Nexavar for a week. Decreased blood flow to the heart and heart attack. Bleeding problems. Nexavar may increase your chance of bleeding. A skin problem called hand-foot skin reaction. This causes redness, pain, swelling, or blisters on the palms of your hands or soles of your feet. Possible wound healing problems. You may need to have a surgical or dental procedure. Very common: lymphopenia, hypophosphataemia, haemorrhage (incl. gastrointestinal, respiratory tract, cerebral), hypertension, diarrhoea, nausea, vomiting, rash, alopecia, hand-foot syndrome (palmar plantar erythrodysaesthesia syndrome), erythema, pruritus, fatigue, pain (mouth, abdominal, bone, tumour, headache), increased amylase and lipase. Common: leucopenia, neutropenia, anaemia, thrombocytopenia, anorexia, depression, peripheral sensory neuropathy, tinnitus, congestive heart failure, hoarseness, constipation, stomatitis (including dry mouth and glossodynia), dyspepsia, dysphagia, dry skin, dermatitis exfoliative, acne, skin desquamation, arthralgia, myalgia, renal failure, erectile dysfunction, asthenia, fever, influenza like illness, weight decrease, transient increase in transaminases. Uncommon: folliculitis, infection, hypersensitivity reactions (including skin reactions and urticaria), hypothyroidism, hyperthyroidism, hyponatraemia, dehydration, reversible posterior leukoencephalopathy, myocardial ischaemia and infarction, hypertensive crisis, rhinorrhea, interstitial lung disease–like events (pneumonitis, radiation pneumonitis, acute respiratory distress, etc), gastro oesophageal reflux disease, pancreatitis, gastritis, gastrointestinal perforations, increase in bilirubin, jaundice, cholecystitis, cholangitis, eczema, erythema multiforme, keratoacanthoma / squamous cell cancer of the skin, Stevens-Johnson syndrome, gynaecomastia, increase in alkaline phosphatase, INR abnormality, prothrombin level abnormality. Rare: QT prolongation. Not known (cannot be estimated from the data available): angioedema, drug induced hepatitis, radiation recall dermatitis. The lady was indeed sharp. She asked me: “Then, that are the solutions?” I must admit I cannot guarantee any cure. We know that in cancer there is no such thing as a cure (meaning, real cure, not just surviving 5 years). In the case of advanced liver cancer, we all know that survival is only in terms of months. So, we are faced with a difficult case. 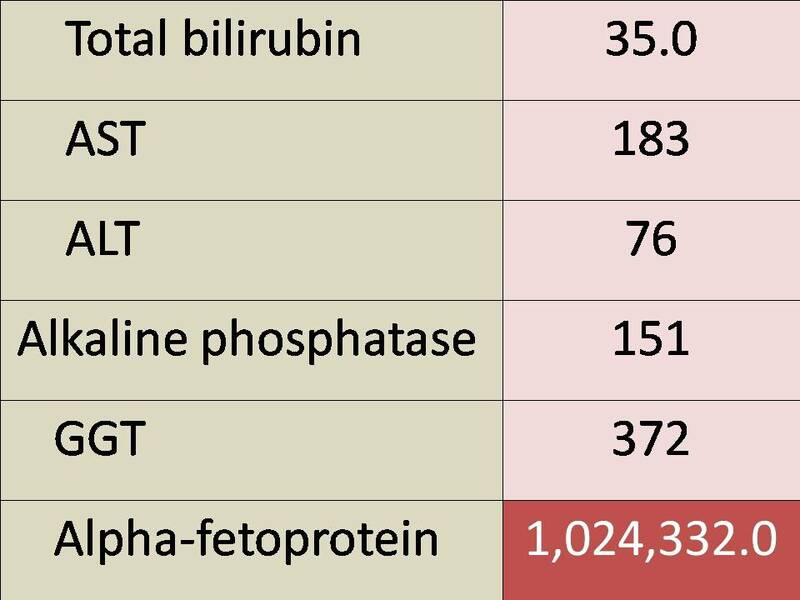 This is the first time that a patient came in with his alpha-fetoprotein reading well over a million. The highest we have ever seen in 14 years is about half that value. We have two suggestions for Mutu. a) Take care of your diet. He was given a list of food that he can and cannot eat. Unfortunately this list is way off the mark compared to our recommendation. b) Take herbs and hope for the best. If a patient has no pain, can eat and sleep – these are about all we can hope for. How long to live is not ours to decide. It is up to Mutu to decide if he wants to continue taking the Nexavar and reap whatever benefits (and also side effects) that are associated with it. But ask this: Is it worth it? Some of you may say: Ah, you snake oil peddler – you and your herbs and dietary fad – these are just quackery. They are not proven and not scientific. Hang on, before you cast the first stone, take time to read the following ten stories. Tell us where we go wrong if you think that we are wrong! 1. Liver Cancer: Two months to live yet still fine after one and a half years! 3. Only On Herbs And She Lives More Than Five Years!